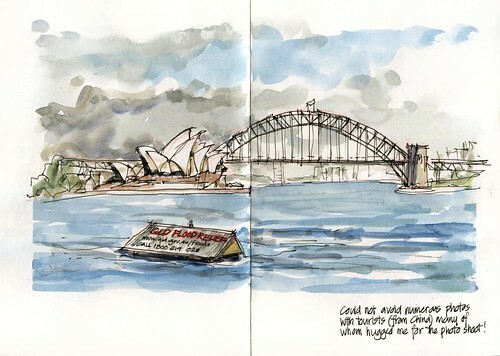 Welcome to the blog for Urban Sketchers in Sydney. I am really excited that over the last 6 months or so we have got together a band of sketchers. My hope is that we can use this blog to share our beautiful city with the world!!! So please start sketching and posting... And if you like, please introduce yourselves! If you don’t know me... I am an architect who never seems to stop drawing and painting! I have lived in Sydney all my life and love it!!! Becoming the Sydney Correspondent for Urban Sketchers has really changed my life – being part of such an inspiring group of artists has been a huge spur to my sketching and has also given me the confidence to sketch on location more and more. I hope to go out sketching tomorrow and post some new sketches but I thought I would start with re-posting this one from a few weeks ago. Here in Australia we have had terrible floods in QLD, NSW and VIC, bushfires in WA and then tropical cyclone Yasi. Now our thoughts are with our friends in New Zealand and those in Christchurch! Our deepest sympathies are with those who mourn or are living in dread of confirmation of lost loved ones.